Christmas Day successes and failures! What worked for you yesterday and what didn't? Everything here was good enough, except I smooth forgot to make the boiled jersey bennes. It wasn't until we were sitting eating did I realise they were still in their box in the pantry. Duh. Re: Christmas Day successes and failures! Just a small 'boo-boo' for me...........despite the fact that I wrote a list of what I was cooking and serving, the new season's specially bought sweetcorn cobs are still alive and well. Obviously my specially written list was not referred to when the day came. We are having another family (Christmas) day next weekend so I hope I've learned a lesson! None of us missed the sweetcorn anyway! The star turn of our lunch was supposed to be the homekill beef fillet that a farming friend contributed. Unfortunately it had been cut so thinly by the homekill butcher that it was impossible to avoid overcooking it. I managed to limit it to medium, but medium-rare would have been so much better. I don't know why it had been cut that way, a terrible waste of a prime cut. The real star turn of the lunch was the Baklava that my husband made. another one who forgot to cook something - bought lots of asparagus & remembered after everyone left that its still in the crisper. Darn!! My sister made a wonderful creation out of three layers of pavlova rounds, with a lovely creme fraiche and crushed raspberry filling, topped with fresh berry's. It ended up about 8 inches tall. I was in charge of cutting it up and it was quite a challenge. After a couple of slices had been cut - I was using the bread knife and a cake slice, the pedestal cake stand it was on toppled over and the whole thing slid off with a flourish onto (luckily) onto the granite work top amongst the bottle caps and used wrapping paper ... swear words were uttered and then we told our 20 odd guests that it was Jamie Olivers recipe and meant to be served like this Mostly family who didn't believe us. More a frustration than a booboo, I spent hours on Christmas eve preparing a beautiful glazed ham, basting it every 15 minutes until it was a beautiful sticky burnished golden brown...on Christmas day the platter came out, and I thought what happened? Went inside to discover ALL of that beautiful fat cut off and discarded into the rubbish! By MY husband nonetheless, he who watched what I was doing! Apparently he thought we always discard the skin, yes dear, we do, but not that glazed fat! Oh no! Is he still alive? Divorce him THEN kill him. The first Christmas that my partner joined us for a big family feast my sister Jenny honoured him by asking him to carve the ham. Beautifully decorated, glazed and burnished it was. I saw T eyeing it up helplessly then he turned the whole thing upside down...something about it 'being the wrong way round' ! Oh the disappointment (closely followed by rage? ), lol. Beautiful big Pavlova that kept superbly well for 2 days prior to being eaten. Thanks Helen for the recipe and to Foodlover friends who offer advice..
After buying the cutters for it several years ago, I was excited to have finally made a cookie Christmas tree this year. I tried to do it last year but it was so hot just before Christmas then that the dough was impossible to handle. (I did learn a lesson that if you're making giant cookies, it's better to roll it out on baking paper, press out the cookie, slide the whole thing onto a baking sheet and then take the excess dough away from the cookie rather than attempting to move a huge floppy raw cookie.) It's no decorating masterpiece (I just wanted a very thin icing and slapped it on in the middle of doing a lot of other things) but I'm so happy to have ticked it off. The cookies were delicious too as I jammed them full of lemon zest and iced them with lemon icing. The only disaster was the weather - if you notice in the background of the photo what looks like a garage, it's because it IS a garage! We always want to eat Christmas dinner outside, but the wind was blowing the rain straight onto the deck. So we moved out the cars, swept out the garage, hung Christmas lights and decorations and put the table right inside by the doors so we could look out at the garden.. It was surprisingly nice! I made Helen's chocolate shortbread this year for gifts and they were all very much enjoyed. I made a gorgeuos vegetarian pie Spinach, chestnut and blue cheese, with a sauce. Had to make my own chestnut puree, and ran out of leeks so used shallots in the sauce. Faliure was defrosting and opening the pastry to find it was all broken up in packaging! Managed to press it together, but not pretty. Congratulations CarolynC, that 'cake' looks spectacular. It would have been a pity to destroy it but I bet it tasted as good as it looks. 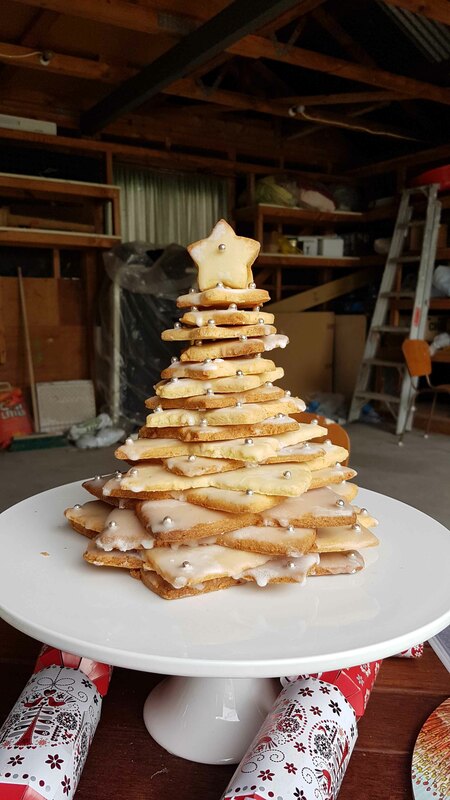 CarolynC...is that a lemon shortbread tree? I had forgotten I have those cutters too and what a splendid idea! I always thought of making it with gingerbread flavours but I think the lemon would be delicious. 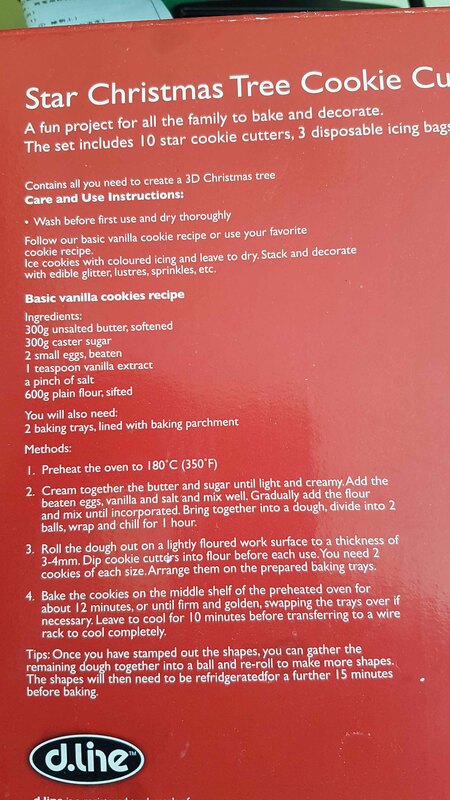 Can you give some idea of quantities for the recipe please. I am compiling an ideas list for next Christmas. Because it was just two of us for Christmas dinner I made mini pavs and froze them as was suggested on foodlovers. They turned out well, froze beautifully and tasted great. Something to remember for the future to avoid Last minute stress. Hi Ali, it's more cookie than shortbread - you can't have anything too crumbly as the weight on the bottom part would I think just break it. You have to move them around quite a bit too while assembling so you need something fairly sturdy. I just used the recipe on the cutter box and added the zest of 4 lemons and made a simple thin icing from icing sugar and lemon juice. They specify 300g butter, 300g sugar, 2 eggs, 1 tsp vanilla and 600g plain flour, oven at 180 for about 12 minutes or until firm and golden (it took a lot longer in my slowish oven). You do need to chill the dough before rolling =- I found it was easiest to chill it in several parts. I've attached a recipe photo in case that's useful. You are a gem! Thanks so much will print it all off and set up a reminder for later this year. Foodlovers are always so helpful! We were in Hokitika so a first (and hopefully last) Christmas without berries and cherries. The supermarket fruit available just didn't cut it. Need to remember to purchase before we travel. The highlight was the Canter Valley stuffed turkey breast - utterly delicious. It cooked in 75 minutes and then rested for 30, it was so moist and tasty. The kids highlight were the brandy snaps bought on a whim on Christmas Eve (while looking for berries and Cherries). They disappeared in about a minute. haha.